Defense Policy Bill Heads to Conference. Formal negotiations on the fiscal 2018 defense policy bill also known as the National Defense Authorization Act (NDAA) are finally underway. Conferees from the House and Senate will work together to hammer out a final version of the bill. Their major hurdle: Resolving the topline dollar amount. The House version of the bill authorized $621.5 billion in the base defense budget and $75 billion for the Overseas Contingency Operations (OCO) account while the Senate’s version authorized $640 billion for the base defense budget and $60 billion for the OCO. Both versions are above the administration’s $603 billion base defense spending request and the Budget Control Act caps for fiscal 2018, which are set at $549 billion. There are many provisions contained in the bills that are important to AUSA, its members and the Army. On Oct. 20, AUSA along with its other partners in The Military Coalition, a group representing 5.5 million currently serving, retired, and former service members and their families and survivors, weighed in on some of those provisions. Force Levels – AUSA and the coalition remain concerned by continuing statements of Service leaders regarding the extent to which our forces are overstretched. We believe force levels should be increased to meet continuing and projected demands. For this reason, we support the House-proposed increases for the Army: Active Duty: 10,000; National Guard: 4000; Reserve: 3000. Military Pay Raise – The coalition believes strongly in the principle of pay raise comparability and believes service members have earned and deserve the same annual raise as the average American’s, as measured by the Employment Cost Index (ECI). We urge the conferees to sustain and reinforce this fundamental comparability principle with a 2.4-percent raise for FY18. AUSA and the coalition support the Senate-passed provision limiting the conditions under which the president may propose an alternative pay raise. Basic Allowance for Housing (BAH) – AUSA and the coalition strongly oppose the Senate-passed plan to deny with-dependent BAH payments to dual-member couples with children sharing the same household. For two married O-4s with children in Washington, D.C., this would impose an annual pay cut of more than $4,000. For married E-7s with children in San Diego, the annual income loss would be more than $5,600. We agree with DoD, BAH is an integral element of military compensation, and any changes should be initiated through the Quadrennial Review of Military Compensation (QRMC) with one underway in 2018 for this very purpose. Further, service members with dependents should not be subjected to this financial penalty based on whether they marry another service member vs. a civilian. For these reasons, we urge conferees to leave with-dependent BAH rules unchanged. TRICARE Fees – AUSA and the coalition oppose the Senate initiative to impose fee increases on currently serving and retired members and families who were explicitly grandfathered against such increases in the FY17 NDAA. Congress expects service members to live up to their commitments, and those who are serving or have completed a career of service should have a reasonable expectation Congress will live up to the reciprocal commitments it has made to them, especially commitments made less than one year ago. Pharmacy Copays – We oppose Senate-proposed increases in TRICARE pharmacy copays and elimination of the COLA-based adjustment process for those copays. The coalition believes these copays already are too high and that recent actual and proposed increases have been determined arbitrarily, with the primary purpose of requiring beneficiaries to fund program changes rightfully the responsibility of the government. For example, the current $10 retail generic copay is already more than double than the $4 Walmart charges people with no insurance for hundreds of generic medications. Military beneficiaries deserve better than repeatedly seeing proposed copay hikes without any principles established for what level of pharmacy benefit their decades of service and sacrifice should have earned. COLA-adjustments contained in current law should continue to ensure fees do not outpace income. Survivor Benefits – AUSA and the coalition are grateful to both chambers for their initiatives to prevent the Special Survivor Indemnity Allowance (SSIA) authority from expiring. But military survivors deserve better than the status quo, or simply COLA-adjusting the current SSIA. The coalition is seeking House and Senate senior leadership support to provide non-HASC/SASC offsets to allow multi-year increases in SSIA amounts, in accordance with Congress’ originally expressed intent to continue increasing SSIA as a means of phasing out the unfair deduction of Survivor Benefit Plan (SBP) annuities for VA’s Dependency and Indemnity Compensation. SSIA increases should not be funded by taking money from other military benefits (e.g., by raising pharmacy copayments). Solutions must come from the government, not the beneficiary. TRICARE Reserve Select (TRS) – We support the Senate proposal to extend TRS eligibility to reserve component members eligible for the Federal Employees Health Benefit Program, funding for which should not be forced on beneficiaries through excessive pharmacy copays. The coalition believes this important equity issue should be funded by selling federal assets or other means that do not compel military beneficiaries to fund obligations that rightfully are the government’s. Hospice Care for Children – The coalition supports the Senate’s provision allowing hospice care coverage for children also receiving curative care. Medicare rules currently prohibit TRICARE coverage of hospice care services for children receiving curative healthcare treatments. Reserve Benefit Comparability – AUSA and the coalition support the House provision granting equal treatment of orders to serve on active duty under section 12304a and 12304b of Title 10. Service members making the same sacrifices in support of our nation should receive the same benefits. We see no reason for Congress to deny equal treatment for equal sacrifice. Assessing Characterization of Discharges – The coalition supports the House provision emphasizing consideration of additional medical evidence and liberal consideration of evidence from VA or civilian healthcare providers relating to PTSD or TBI for correction of military records as relates to discharges or dismissals. TMC likewise supports the Senate provision, with regard to survivors of sexual assault, which includes those who allege sexual assault. 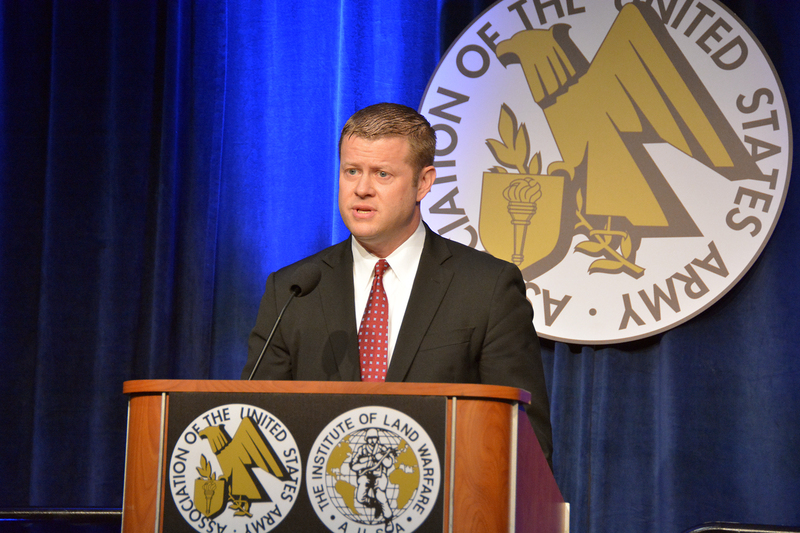 AUSA’s Congressional Breakfast Breaks Records. This year’s Congressional Staff Breakfast, held during the AUSA Annual Meeting and Exposition, was one of the best attended congressional events in the association’s history, with AUSA President Gen. Carter F. Ham, USA, Ret., hosting approximately 700 attendees. More than 270 key congressional staff members were among the guests. The event featured two speakers. The Army chief of staff, Gen. Mark Milley, who addressed the group and described the way forward as the Army continues to provide service to the nation and strength for the future. After he spoke, the Army’s Acting Secretary Ryan D. McCarthy provided his view of the state of the Army to the gathering that included top leaders of the Army, both military and civilian. McCarthy told the crowd that failure to pass the FY 18 budget will prevent the Army from modernizing, and “will force us to continue mortgaging our future readiness and lethality. “Above all, the Army needs sufficient, sustained, and predictable funding, to restore balance and reduce risk. We defend the nation with a force based on a strategy, not on a budget”, McCarthy said. McCarthy said, “I have initiated a reprioritization of money in the POM, and a science and technology review that will support development of these efforts. And I will continue to invest in them with ruthless prioritization with resources protected across the five-year Future Years Defense Plan. “First, a precision fires capability that restores US Army dominance in range, munitions, and target acquisition. “Second, next generation combat vehicles, including optionally-manned variants with the most modern firepower, protection, mobility, and power generation capabilities, to ensure our combat formations can fight and win against any foe. “Third, future vertical lift platforms – optionally-manned, both attack and lift, that are survivable on the modern and future battlefield. “Fourth, an Army network that is mobile and expeditionary – that can be used to fight cohesively in contested cyber and electromagnetic environments. “Fifth, air and missile defense capabilities like mobile-SHORAD (Short Range Air Defense), directed energy, and advanced energetics – capabilities that ensure our future combat formations are protected from modern and advanced air and missile delivered fires – including drones. The new command will draw from within existing force structure, officials said, and is not expected to create civilian job losses or movements. The Army plans to stand up the new organization by the summer of 2018. As such, the Army has assigned Lt. Gen. Edward Cardon to lead a task force that will study and plan the new organization. Cardon has begun the 120-day planning process.